Published by Reed Books. First published 1997. Softcover. Size: 240mm x 180mm. 148 pp. 17 x Colour pages of flies. Essentially an update and expansion of Keith Draper’s earlier hugely successful work Trout Flies in New Zealand. New Zealand Trout Flies Traditional and Modern by Keith Draper. Written by one of New Zealand’s foremost exponents of fly-fishing, Keith Draper’s New Zealand Trout Flies Traditional and Modern is a comprehensive and informative catalogue of the flies, nymphs and lures used on the New Zealand trout fishing scene. 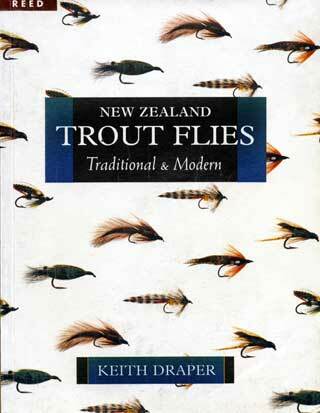 An essential reference for fly-fishing enthusiasts, it includes patterns of both local and imported design that have become standard since the publication of the author’s best-selling Trout Flies in New Zealand, as well as many traditional flies of historical interest and importance. New Zealand Trout Flies reflects the development of the artificial trout fly in New Zealand, from flies used by early colonists through to the present day. The influence of the modern English school of still water angling can be seen, as can evidence of American fly-tying trends in recent decades. Some uniquely New Zealand flies have since been adopted by fly-fishers in the United Kingdom and North America, demonstrating that the exchange of ideas is by no means one way. Richly illustrated with anecdotes and featuring many well-known local fly-fishing personalities, New Zealand Trout Flies traces the origins of patterns and acknowledges the contribution of the creators to the world of fly-fishing. Entries give details of each dressing, and colour plates show over 400 flies. Keith Draper has enjoyed over fifty years of fly-fishing experience including more than thirty years in the fishing tackle trade, during which his Taupo-based business supplied trout flies throughout New Zealand, as well as to Australia and the USA. 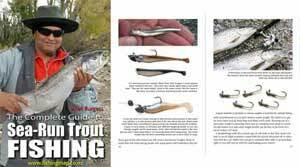 He is the author of nine books on trout flies and fly-fishing, including Fly Fishing for Beginners and the best-selling Trout Flies in New Zealand. Since his retirement in 1994, he has continued to write as the field editor for New Zealand Fishing News, as a contributor to Fish and Game magazine and for newspaper columns, and has been published in Australia and the USA. Keith Draper died on 22 February 2000.